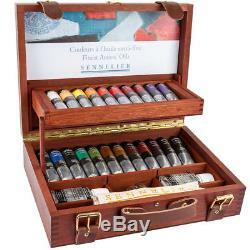 PRODUCT : Sennelier Artist Professional Oil Paint Wooden Box Set - 22 x 40ml Tubes. 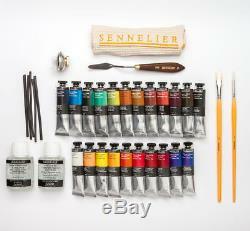 Sennelier gathers only the finest natural and inorganic pigments from around the world for their Artist's Oil Colour. The pure pigments are ground very slowly with extreme care to an extrafine consistency. They are then combined at maximum concentration with archival safflower oil (non yellowing) to yield the highest possible tinting strength and lustrous satin finish. 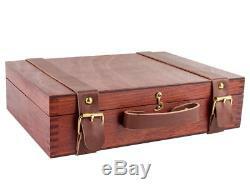 This beautiful, oil varnished wooden box set with leather straps includes the following. 22 extra-fine oil tubes of 40ml (Zinc titanium white, Naples yellow warm, Cadmium Yellow Lemon Hue, Chinese Orange, French vermilion, Cadmium red deep hue, Carmine Red, Ultramarine Light, Ultramarine Deep, Indigo hue, Chromium Green Deep, Emerald green, Chromium Greeen Light, Indian Yellow hue, Yellow Ochre, Burn Sienna, Red Ochre, Caput Mortum, Raw Umber, m Ivory black). 1 jar of turpentine 75ml. 1 jar of gloss painting varnish 75ml. 2 brushes (351 n°10 and 350 n°8). Box size: 335 x 245 x 90 mm. 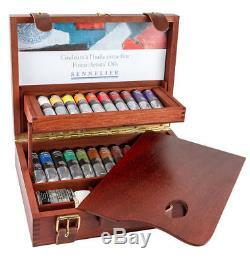 The item "Sennelier Artist Professional Oil Paint Wooden Box Set 22x40ml Tubes +Accesories" is in sale since Sunday, November 19, 2017.